These are lovely photos! You did a fantastic job of finding that exact same place in these landscapes that made this effect really… well, effective. Actually, now that I look at them again are they even the same place? 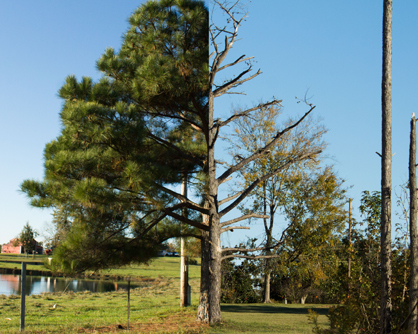 There is a definite difference of horizon line in the first image of the tree, which argues with the second image. I would choose one or the other personally and decide what I’m trying to communicate. I agree that you did a really good job lining these pictures up which makes your idea very effective. It’s very cool. I love that we see the tree and field in different stages of growth. The tree is fully in bloom with all its pine needles or leaves, and then we see it completely bare. Are they the same kind of tree? I think it’s cool that the field has flowers on one side and the other it looks more like wheat or something. I like that the horizon line matches up in the second photo and I think maybe you should try that with the first. Are these the same places or no? I love your concept and I really like the fact they both look like different places because of the season changes. It looks fantastic. These images are displayed conceptually well. I love that this shows time that shows life and regrowth with life and progressing and death taking over. I agree that you lined these up really well so there’s not much that distracts from the main focal point of the images. Even though the horizon doesn’t really line up in the first one I didn’t notice that right away so I don’t think it takes away from the photo. Overall very nice pictures. I like the idea behind this series and how it shows the change of landscapes and seasons. I agree with Zachary that the differing horizon line in the first photo throws it off a bit. I think the contrast between the brown grass and white flowers in the second photo makes it more striking than the first photo. the top photograph catches my eye the most out of these two; it mostly has to do with how both sides of it almost mach in color and setting, although not as linear as the bottom photograph, which is an interesting concept with the season shift done here. I really like these photos. I like the idea of seeing one landscape during multiple times of the year to see the changes in appearance. I do agree with the first comment though about how the horizons lines in the first picture through you off a bit. It is always interesting to see two images of the same subject showing the passing of time, and you have done so very well. I really like the one of the tree, although I wish you hadn’t cropped the top of it. Nice lighting and sharpness in both of them. Placing two exact photos side by side during different times of the year has been shown in an effective way. The first one is cohesive and subtle, as well as dynamic. The second photograph is lined up perfectly. Overall, it’s interesting to look at….however agreeing with the comment above-I’d choose one or the other. I absolutely love these photos! The bottom picture is wonderful and the horizon line is perfect. These are two very interesting and unique photos. Shooting 2 a similar pictures with different seasons would be another idea on further extending this idea. I love the bright colors in the top, especially with the blue and green together. Also, I would love to see images like these very large instead of 14 x 17. Great work! These pieces are very nice, it is great to see you match the different photos so nicely. The horizon lines are near perfectly matched. The concept of seasons and time going by is very interesting and is displayed well with these pieces. Neat idea. The different seasons look cool. I think your pictures have good lighting. It would have been cool to see the sky being a common factor being the same color but obviously that would have been hard to do. Nice, job love the concept. I like the change of season in the picture. I also like that the tree can literally be cut in half to show the stark contrast between both the fall and winter. What stands out the most about this picture is the contrast between each side of each image because you spend time comparing the two. The season changed, and the time past. I like the contrast of the photo, and I love the concept of the photographer. I also love the frame of these photos. The color in the first one looks so balance. And the horizontal line in the second one makes it in good proportion. The first photo of the divided treescape is jarring. At first glance I thought it was the same tree at different seasons. Then upon closer examination I realize that these are different places combined together. I think it’s interesting how my eye and mind search of symmetry immediately, and only later allow for the asymmetry to appear. You captured a sense of surrealism in the first photo, at a first glance it appears as if this image was captured as a whole, and leaves me to believe that half of the tree is bare. Then at a closer look, I realized they were different seasons. The lighting was very successful in creating a cohesive photograph. I love the contrast in each photo and difference between each although it’s the same concept. The first one blends so well it actually looks like it was taken at the same time. The second one has each side competing for attention but complement each other. I too have been interested in the time lapse of seasons. I applaud you for your precise alignment – I know that is not easy. Your use of natural lighting and contrast was a good choice because it resembles the actual landscape as close as possible. Overall nice job! I find it interesting that the two halves are different from each other. For the pine tree, it has its leaves on the left, and is bare on the other. Same thing for the field, but just reversed. Contrasting how these two look is a unique concept seeing beauty in more ways than just one. This picture is interesting for me as the change is so dramatic but the seem is so perfect. 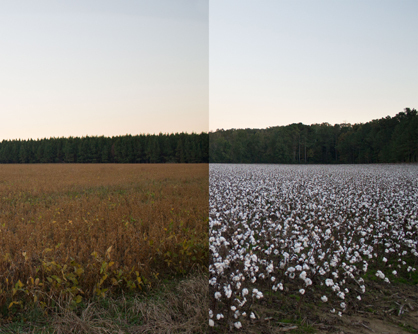 Seeing the seasons compared at different times of the year in the same place is intriguing. Taking an image in the same location every 3 months and stitching that together would be an interesting comparison. I’m a huge fan of transformation pictures. I think the contrast between seasons highlights the patience of the artist as it parallels with nature’s ‘patience’. I enjoy that the sky is the same tone in the first photo, and while I know it may be a stylistic choice to keep as-is, I would love to see the second photo with the two-tone skies blended just a bit. I think this would draw the focus onto the drastic change of the plants/snow. Just a thought. Love these. I have seen a good amount of images such as this where two different photos are stitched together at different times of the year, but never have I seen such a seamless set of photos as these. Although in the first image the horizon line is at two different spots, the tree looks perfectly together as a whole which is definitely working for the overall image. In the second photo I am personally very drawn to this because not only is the horizon line continuously one line, but even the trees look as though you took the photo as one image. I questioned whether or not the different colors of the sky actually work and I believe they do. It shows the transformation of time all the while it is tricking us into seeing it as one whole image. The accuracy of the horizon line in the bottom image is astounding. The work itself is elegant, wonderfully executed, and well seen. The colors are also doing wonders for the overall composition. i really love the idea behind the photographs and effort. The images are simple/natural looking but also really beautiful and powerful. This are incredible pictures. It is amazing how you decided to separate the picture into two. I love the decision of portraying the change of landscape as the seasons and time passes by. The tree one is very inspiring! Also, I like your use of composition and lighting to express the changes.